Malaysia’s Tugu Negara ( National Monument ) is dedicated to the eleven thousand people from various races and countries who have died during the Malaysian Emergency (1948 -1960) which was the armed struggle between the British / Malayan Government and the Malayan Communist Party (MCP). At which the the latter’s struggle was to make Malaya a communist state. The Tugu Negara ( National Monument ) Complex , Cenotaph in the background, the Central Pavilion in the middle and the bronze sculpture in the foreground with the surrounding reflecting pools. 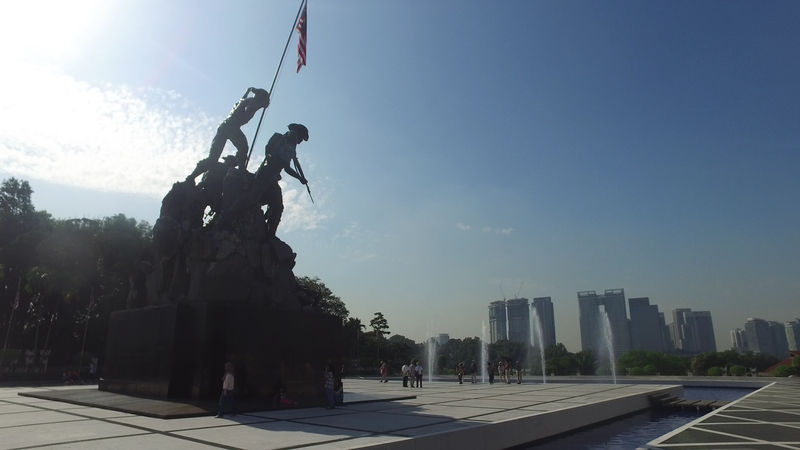 It was on a visit to the United States Marine Corps War Memorial that inspired the first Prime Minister of Malaysia (then Malaya) Tunku Abdul Rahman to build Malaysia’s National Monument or Tugu Negara in Kuala Lumpur. 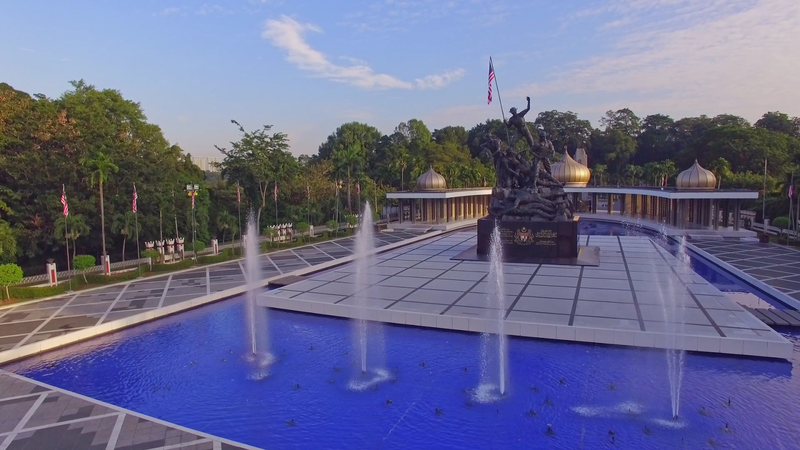 The Tugu Negara complex was designed (after persuasion by Tunku Abdul Rahman) by an Austrian sculptor, Felix de Weldon who also designed the United States Marine Corps War Memorial. 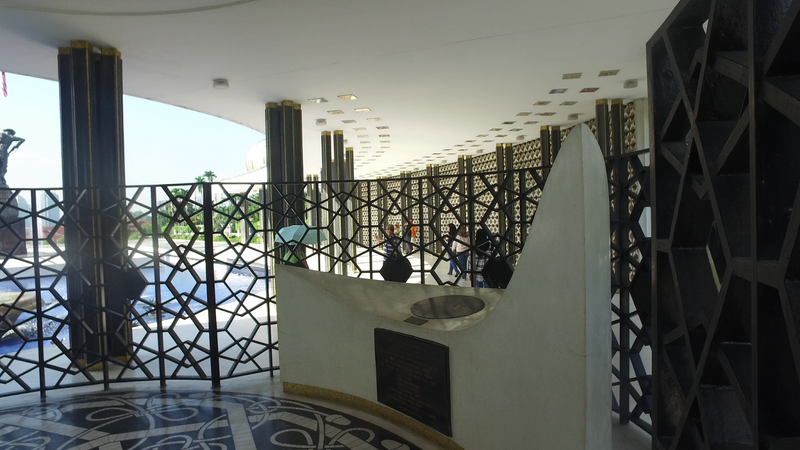 The Tugu Negara complex took three years to complete and was finally opened in 1966, sitting on a twelve-acre park which comprises The Cenotaph ,The Central Pavilion, reflecting pool and the bronze sculpture. The sculptor was later bestowed with the title Tan Sri which is a Malaysian knighthood award. 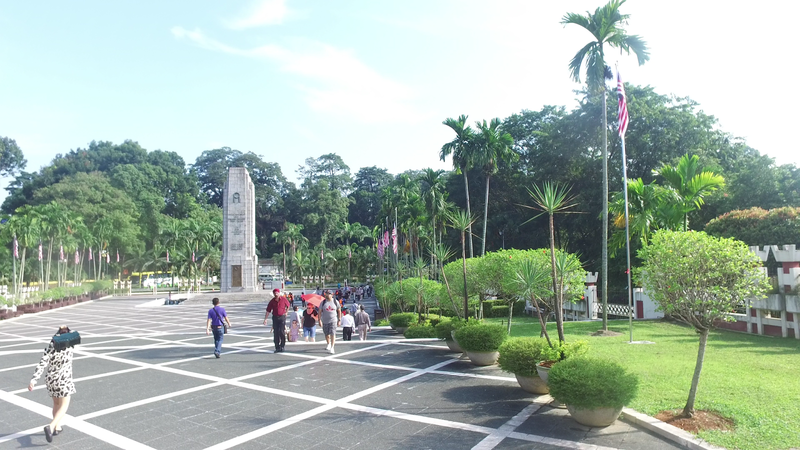 The Cenotaph, a memorial built by the then British colonialists government close to the former Railway Station, was supposedly built to remember those who had died during the First World War but later it added names of British Malayan soldiers who died in the Second World War and the Malayan Emergency. 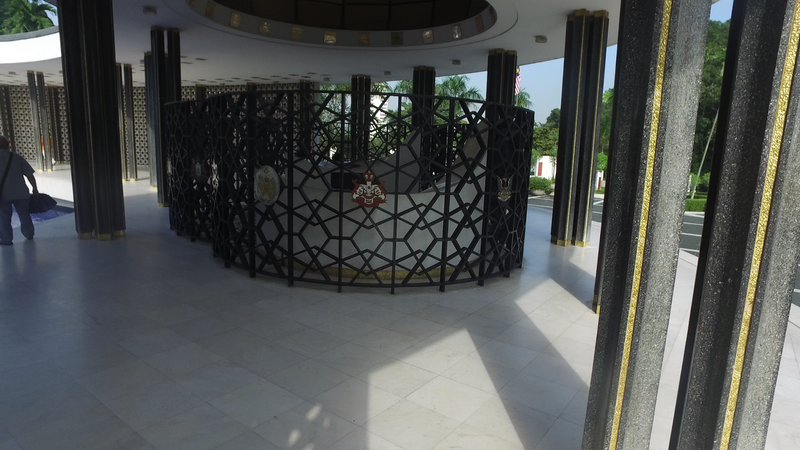 The Cenotaph was later moved from it’s original position to the vicinity of the Tugu Negara complex in 1964. Regimental Plaques from various Regiments that participated during the Malayan Emergency period. Grilled enclosure with vaults containing names of the fallen. The Central Pavilion complex is a flat roofed crescent shaped pavilion with three domes with pointed spires on it. Underneath the central dome is a grilled enclosure where a vault containing the names of the fallen heroes are recorded on microfilm for posterity purposes. 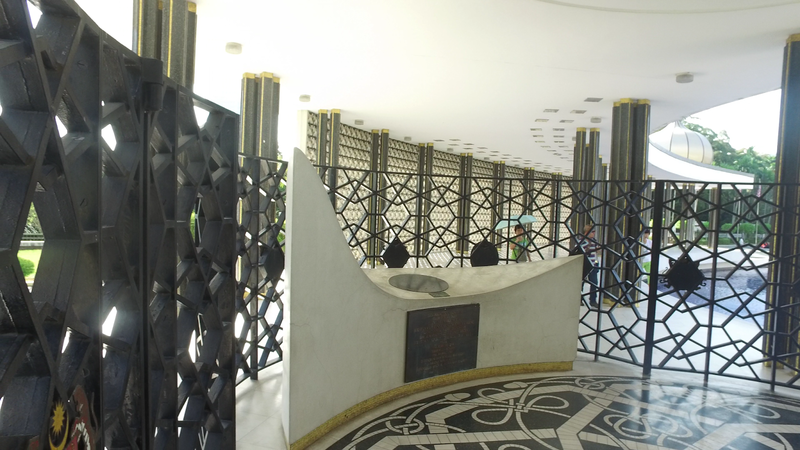 The floors of the Central Pavilion is paved with marble from Langkawi island. 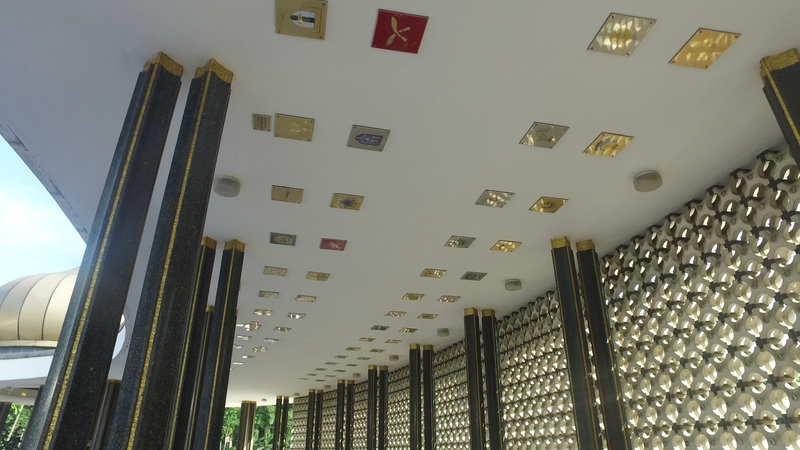 On top of the ceiling of the Central Pavilion are plaques of Regiments of the British, Commonwealth and the Malaysian Army that fought during the Malayan Emergency. A semi-circular shaped pool with fountains and bronze water lilies is located near the Central Pavilion complex. The sculptor’s name engraved in romanised letters. 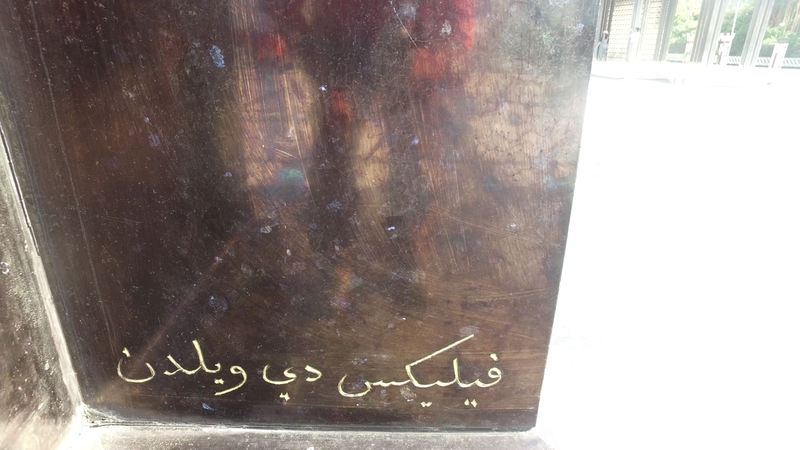 The sculptor’s name engraved in Arabic letters. The fifteen metre high bronze sculpture has seven figures of which five of them represented the victorious Malaysian soldiers and the other two figures represented dead defeated communist terrorists. The figures represent leadership, suffering, unity, vigilance, strength, courage and sacrifice . The stones that the soldiers are standing on were imported from Karlsham, Sweden while the sculptures were cast in Italy. This bronze sculpture was partially destroyed by the communist terrorists in 1975 and it was fully restored in 1977. 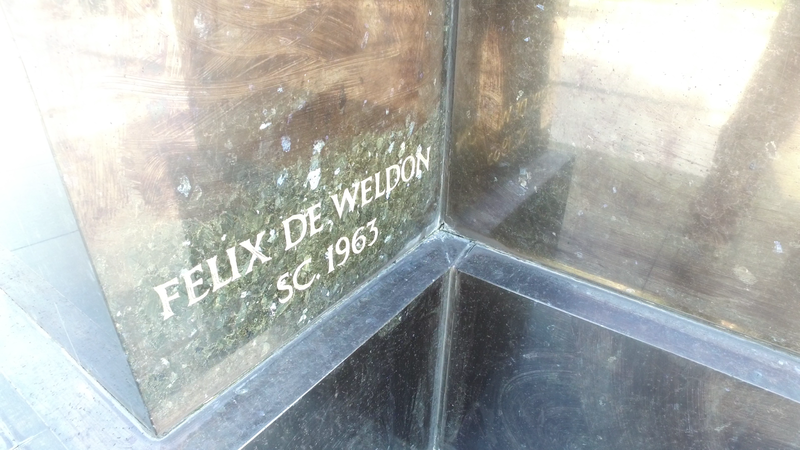 The name of Felix de Weldon is engraved in romanised and Arabic letters at both the left and right base of the Tugu Negara.